Iceland has some of the best waterfalls in the world. The terrain is a perfect combination of rugged mountains and melting glaciers in the summer, so there are over 10,000 waterfalls here! The best way to see these waterfalls is to rent a car and take a road trip along the Ring Road, which loops in a circle around the entire island of Iceland. Seljalandsfoss is one of the first waterfalls you’ll see if you drive south on the Ring Road from Reykjavik. It’s also one of the most popular and photogenic waterfalls in Iceland. When you’re done admiring the 200 foot falls from the front, you can walk behind the waterfall for another perspective. Careful with your electronics near the falls, because there’s a lot of mist! Waterproof clothes can be handy here. In the summer you can usually see a ton of wildflowers and rainbows near Seljalandsfoss. 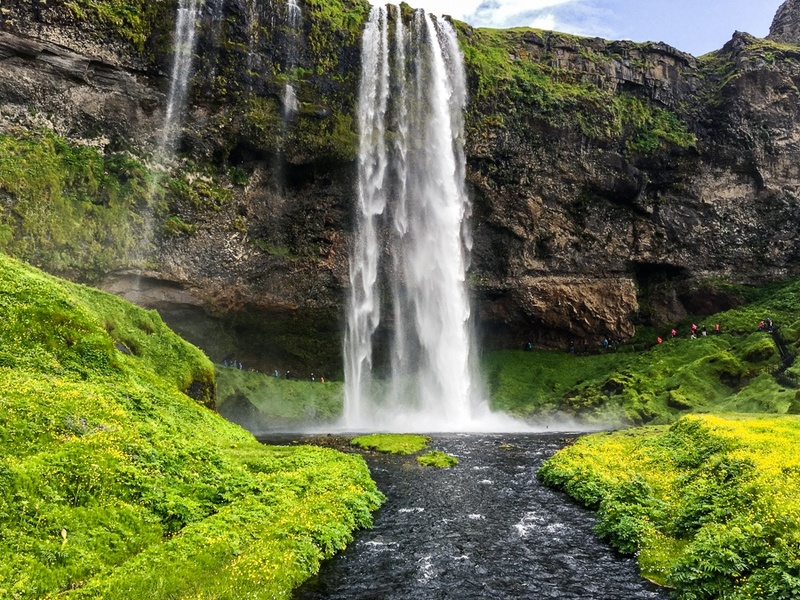 While you’re at Seljalandsfoss, don’t forget to visit the Gljufrabui waterfall too! This is a neat hidden waterfall that you can reach on a short 5 minute walk from Seljalandsfoss. The 130 foot falls are hidden inside of a cave, but you can get a closer look by either walking through the opening of the cave OR climbing up above it and peering through an opening in the ceiling of the cave. There is an insane amount of mist and moisture inside the cave, so I wouldn’t go in there without waterproof clothes and gear. Go south along the Ring Road (Route 1). Seljalandsfoss is about 75 miles (120 km) from Reykjavik, so it can easily be done as a day trip, along with Skogafoss and some other nearby attractions. No hiking or entry fee is required to visit Seljalandsfoss.